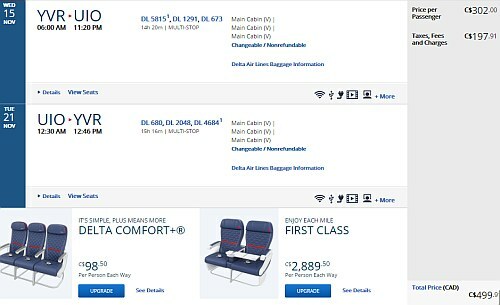 Delta has dropped the price of their flights from Vancouver to Quito, Ecuador down to $499 CAD roundtrip including taxes. The flights have 2 stops each way, but with a total travel time of 14 hours each way, they're actually pretty decent travel durations, for Ecuador. There are also flights from Vancouver to Santiago, Chile (SCL) for $773 CAD roundtrip. 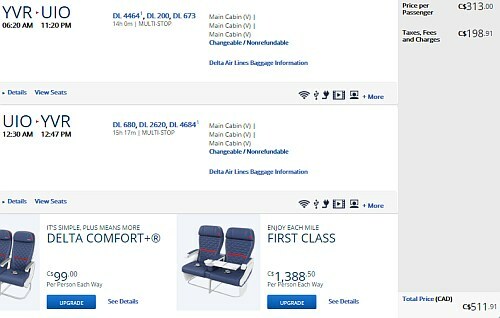 American Airlines has also dropped the price of their flights from Vancouver to Quito, Ecuador down to $478 CAD roundtrip including taxes over a similar date range. 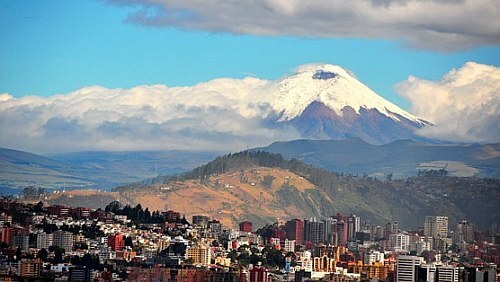 Update 10/10 - Flights from Vancouver to Quito, Ecuador have returned today for $511 CAD roundtrip including taxes. There are dates available in November 2017, and January, February 2018. Update 10/10 - Delta is now showing flights from Victoria (YYJ) to Quito, Ecuador (UIO) for $439 CAD roundtrip including taxes. There are dates available in October/November 2017 and January/February 2018. 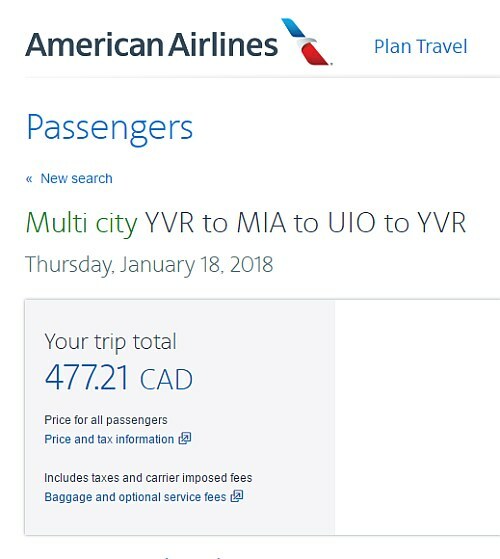 Vancouver to Quito flights are also showing up for $450 CAD roundtrip, but there doesn't seem to be any dates without ridiculously long flights. From Victoria to Quito, there are dates with reasonable flight durations (14-16 hours). 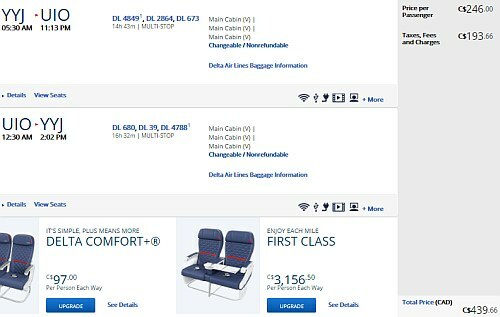 Update 10/16 - Flights from Vancouver to Quito, Ecuador have returned again today on Delta for $486 CAD roundtrip including taxes. There are dates available in November 2017, and January, February 2018. NOTE: After your Flighthub search completes, you can try clicking on Flexible Dates to see a few more dates around the same time. But keep an eye on the flight durations. 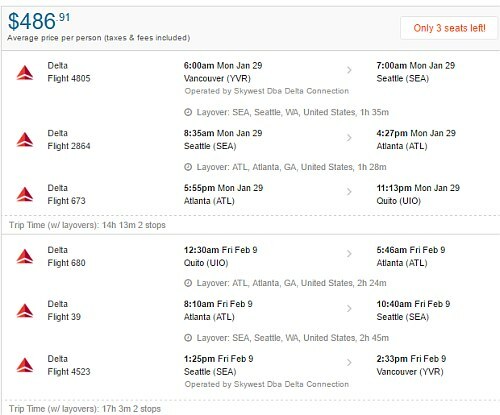 A lot of dates have really long flights. For longer trips, you can try mixing and matching dates from different lines in the list below. vancouver, yvr, flight deals, south america, victoria, yyj, santiago, chile, scl, quito, ecuador and uio.